A mixture of shows and workshops as part of summer scheme activities in Ritzona refugee camp and Serres refugee camp in Greece. The shows were arranged mainly for children in refugee camps in Lebanon and Jordan comprised of Syrian refugees with a mixture of people from Iraq, Iran, Afganistan, Palestine, Somalia and Jordan. 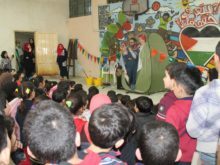 Invited by NGO Al-Jana, the show was arranged for Palestinian and Syrian children living in refugee camps across Lebanon. 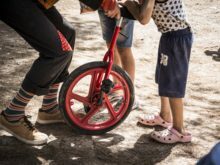 In June, Clowns Without Borders Ireland did some peformances in refugee centers thoughout Ireland and participated to the Family Fun Day in Lexlip for homeless people and their families. In November 2016, Clowns Without Borders Ireland toured some camps for Internally Displaced People In Iraqi Kurdistan. In February 2016, Clowns Without Borders Ireland did performances and workshops in Palestinian and Syrian refugee camps, for 5270 people in total. In April 2016, Clowns Without Borders Ireland did a performance tour of UNHCR camps and children's projects in Jordan. 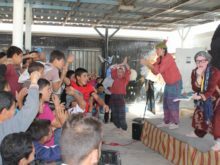 In April 2015, Clowns Without Borders Ireland did a performance tour of UNHCR camps in Jordan and a project with the children.